American-born Mohammed Hamzah Khan is a convicted would-be foreign fighter for ISIS. Khan was arrested in October 2014 at Chicago’s O’Hare International Airport when members of the FBI Joint Terrorism Task Force intercepted him and his siblings seeking to fly to Istanbul.Kevin Sullivan, “Three American teens, recruited online, are caught trying to join Islamic State,” Washington Post, December 8, 2014, http://www.washingtonpost.com/world/national-security/three-american-teens-recruited-online-are-caught-trying-to-join-the-islamic-state/2014/12/08/8022e6c4-7afb-11e4-84d4-7c896b90abdc_story.html. Khan and his siblings—minors whose names have not been released by authorities—intended to enter Turkey and cross the border into Syria to join ISIS.“Federal Grand Jury Indicts Mohammed Hamzah Khan for Allegedly Attempting to Support Terrorism Overseas,” Federal Bureau of Investigation, January 9, 2015, http://www.justice.gov/opa/pr/federal-grand-jury-indicts-mohammed-hamzah-khan-allegedly-attempting-support-terrorism. Khan pled guilty in October 2015 to one count of attempting to provide material support to a terrorist organization.Jason Meisner, “Bolingbrook man pleads guilty to terrorism charge,” Chicago Tribune, October 29, 2015, http://www.chicagotribune.com/news/local/breaking/ct-terror-case-bolingbrook-man-plea-20151029-story.html. In November 2016, he was sentenced to 40 months in prison with 20 years of “intensive” supervised release, according to the Department of Justice.“Illinois Man Sentenced to 40 Months in Federal Prison for Attempting to Provide Material Support to ISIL,” U.S. Department of Justice, November 18, 2016, https://www.justice.gov/opa/pr/illinois-man-sentenced-40-months-federal-prison-attempting-provide-material-support-isil. According to U.S. authorities, Khan communicated with ISIS operatives over the internet in order to assist him with traveling to Syria.“Illinois Man Sentenced to 40 Months in Federal Prison for Attempting to Provide Material Support to ISIL,” U.S. Department of Justice, November 18, 2016, https://www.justice.gov/opa/pr/illinois-man-sentenced-40-months-federal-prison-attempting-provide-material-support-isil. Following Khan’s October 2014 arrest, the FBI gathered letters, notebooks, and diaries from the Kahn family residence where he had lived.Jethro Mullen and Ted Rowlands, “Who is Mohammed Hamzah Khan,” CNN, October 7, 2014, http://www.cnn.com/2014/10/07/us/who-is-mohammed-hamzah-khan/. Some of the evidence contained text promoting ISIS and criticizing the West, primarily the United States and its “national defense.”“Letter prosecutors say Mohammed Hamzah Khan wrote to his parents,” Chicago Tribune, November 3, 2014, http://www.chicagotribune.com/chi-letter-prosecutors-say-mohammed-hamzah-khan-wrote-to-his-parents-20141103-htmlstory.html. In a letter Khan left for his parents before his attempted to fly to Turkey, he wrote, “Western societies are getting more immoral day by day. I do not want my children to be exposed to this filth.”Michael Walsh and Bill Hutchinson, “Illinois man busted trying to join ISIS left letter behind for parents: FBI,” New York Daily News, October 7, 2014, http://www.nydailynews.com/news/national/illinois-man-charged-join-isis-overseas-fbi-article-1.1964946. Khan’s family, friends, and neighbors were reportedly stunned by his actions.Jethro Mullen and Ted Rowlands, “Who is Mohammed Hamzah Khan,” CNN, October 7, 2014, http://www.cnn.com/2014/10/07/us/who-is-mohammed-hamzah-khan/. One of the Khan’s neighbors Steve Moore stated, “[Mohammed was] very polite. Seems normal, normal family.”Eric Horng, “Bolingbrook Man Faces Terrorism Charges, Allegedly Tried Join ISIS,” ABC 7 Eyewitness News, October 6, 2014, http://abc7chicago.com/news/bolingbrook-man-arrested-allegedly-tried-to-join-isis/338672/. Khan was studying computer science and engineering at Benedictine University in Lisle, Illinois and volunteered at his local mosque.Kevin Sullivan, “Three American teens, recruited online, are caught trying to join Islamic State,” Washington Post, December 8, 2014, http://www.washingtonpost.com/world/national-security/three-american-teens-recruited-online-are-caught-trying-to-join-the-islamic-state/2014/12/08/8022e6c4-7afb-11e4-84d4-7c896b90abdc_story.html.> A fellow mosque member, Bahauddin Ali Khan, told reporters, “[Mohammed’s] the last person that you’d think that would happen to.”Eric Horng, “Bolingbrook Man Faces Terrorism Charges, Allegedly Tried Join ISIS,” ABC 7 Eyewitness News, October 6, 2014, http://abc7chicago.com/news/bolingbrook-man-arrested-allegedly-tried-to-join-isis/338672/. While Khan’s parents admitted to raising their children in a protective environment, they told the Washington Post in December 2014 that their children behaved “like any other normal American family.”Kevin Sullivan, “Three American teens, recruited online, are caught trying to join Islamic State,” Washington Post, December 8, 2014, http://www.washingtonpost.com/world/national-security/three-american-teens-recruited-online-are-caught-trying-to-join-the-islamic-state/2014/12/08/8022e6c4-7afb-11e4-84d4-7c896b90abdc_story.html. Khan’s mother, Zarine Khan, has claimed that her children are victims of extremist propaganda, and has condemned what she called extremist groups’ “recruiting” and “brainwashing” tactics.“Mom to Terrorist Groups: Leave Our Children Alone,” NBC Chicago, January 13, 2015, http://www.nbcchicago.com/news/local/Mohammed-Hamzah-Khan-288401591.html. As part of Khan’s supervised release, the Department of Justice will demand that Khan participate in a mental health treatment program, attend “violent extremism counseling,” and comply with a computer monitoring program, among other requirements.“Illinois Man Sentenced to 40 Months in Federal Prison for Attempting to Provide Material Support to ISIL,” U.S. Department of Justice, November 18, 2016, https://www.justice.gov/opa/pr/illinois-man-sentenced-40-months-federal-prison-attempting-provide-material-support-isil. 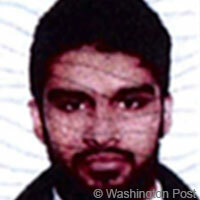 American-born Mohammed Hamzah Khan is a convicted would-be foreign fighter for ISIS. “I am…obliged to pay taxes to the [U.S.] government… This in turn will be used automatically to kill my Muslim brothers and sisters… I simply cannot sit here and let my brothers and sisters get killed, with my own hard-earned money…I cannot live under a law in which I’m afraid to speak my beliefs. I want to be ruled by the Sharia [Islamic law], the best law for all-mankind.”“Letter prosecutors say Mohammed Hamzah Khan wrote to his parents,” Chicago Tribune, November 3, 2014, http://www.chicagotribune.com/chi-letter-prosecutors-say-mohammed-hamzah-khan-wrote-to-his-parents-20141103-htmlstory.html. “Nonetheless, me living in comfort with my family while my other family are getting killed is plain selfish of me.”“Letter prosecutors say Mohammed Hamzah Khan wrote to his parents,” Chicago Tribune, November 3, 2014, http://www.chicagotribune.com/chi-letter-prosecutors-say-mohammed-hamzah-khan-wrote-to-his-parents-20141103-htmlstory.html. “An Islamic State has been established and it is thus obligatory upon every able-bodied male and female to migrate there.”Kevin Sullivan, “Three American teens, recruited online, are caught trying to join Islamic State,” Washington Post, December 8, 2014, http://www.washingtonpost.com/world/national-security/three-american-teens-recruited-online-are-caught-trying-to-join-the-islamic-state/2014/12/08/8022e6c4-7afb-11e4-84d4-7c896b90abdc_story.html. “Muslims have been crushed under foot for too long…This nation is openly against Islam and Muslims… I do not want my progeny to be raised in a filthy environment like this.”Kevin Sullivan, “Three American teens, recruited online, are caught trying to join Islamic State,” Washington Post, December 8, 2014, http://www.washingtonpost.com/world/national-security/three-american-teens-recruited-online-are-caught-trying-to-join-the-islamic-state/2014/12/08/8022e6c4-7afb-11e4-84d4-7c896b90abdc_story.html. “We are all witness that the western societies are getting more immoral day by day. I extend an invitation to my family to join me in the Islamic States. True, it is getting bombed, but let us not forget that we didn’t come to this world for comfort.”Kevin Sullivan, “Three American teens, recruited online, are caught trying to join Islamic State,” Washington Post, December 8, 2014, http://www.washingtonpost.com/world/national-security/three-american-teens-recruited-online-are-caught-trying-to-join-the-islamic-state/2014/12/08/8022e6c4-7afb-11e4-84d4-7c896b90abdc_story.html. “We are the lions of the war. My nation, the dawn has emerged.”“Criminal Complaint,” United States District Court, Northern District of Illinois, Eastern Division, October 6, 2014, https://www.ice.gov/sites/default/files/documents/Document/2014/suburban-chicago-man-arrested-for-allegedly-attempting-to-support-terrorism-overseas.pdf.